This whole black Friday/cyber Monday madness? I’m LOVING it. I have almost all the Christmas shopping one for my family and Chris’. The best part- I did it all without leaving the house. Shopping online is the best thing ever. Easy to compare prices, easy to find sales and easy to get it all done at once. The UPS guy is going to think I’m a crazy person. I also save a ton of money on a new computer monitor for the office, and a vacuum to replace the one that smelled like burning. Woohoo! I’ve got a bunch of stuff planned to buy from the farmer’s market, as the holiday gets closer, and I’m going to make some presents, so I’m keeping it local and home-grown as much as possible, too. Belly dance costume pieces = tree ornaments! All that holiday shopping put me in the Christmas mood. We had some time to kill this morning before the farmer’s market opened (they’ve switched to their winter time, and open at 10 now) so swung by wholefoods to pick up a little rosemary tree. It’s my favorite way to be festive. Makes the house smell awesome, useful for cooking and nice and size appropriate for a cramped South Philly row home. The rest of the decorating was super easy. Embarrassingly, the stockings I made for us have been up since last year, as have the lights around the window. I had packed away the small light strand for the tree in a bag with the rigged left-over-costume-piece ornaments, so that part was easy too. The lights on the banister are up all year, too… a white strand paired with a set of awesome robot lights. They get turned on for parties, and pair with my tree quite nicely! This year I had some extra ornaments. Chris has some kinda-creepy Santas that he’s had for ages… When he was a kid he was allowed to pick ornaments every year, and he picked out the Santas. To match the strange Santa ornaments, I have a set of snowmen carolers that I’m sure anyone else would scoff at. I don’t really know the history of them, other than I grew up with a set at my Mom’s house, and I think my cousins had some too. I think they came from some sort of sale at my Gram’s office, but I’m not sure. They look pretty home-made, so that would make sense anyway. One of the snowmen I grew up with lost his little hat at some point, and it was replaced with a crochet one. When we were going through my Grandfather’s house we found some extra snowmen in the attic. I brought them home with full intent to put them out last year, but completely forgot about them in the basement. This year… prominently displayed on the stairs above the tree. Love them! Way more festive this year. Rosemary tree! Almost done with shopping! I also have very little voice. I think I got sick from the kidlets on Thanksgiving or Jexi at the fashion show. Either way, I’ve been sick for a week, and completely lost my voice on Thursday. Its slowly coming back, but I’m not supposed to talk. Which makes planning our upcoming road trip very difficult. And grocery shopping. And pretty much anything. Even with no voice, yesterday was extremely productive. Lots of Christmas presents bought, some even wrapped! Christmas tree decorated… okay, so it is a little rosemary cone, and doesn’t really need much decoration, but still… festive! While shopping for presents for the kids, Chris tried to convince me to buy the lego Millennium Falcon. I couldn’t bring myself to spend $140 on it, though, but we did go for the Hoth set. A Wampa! After we finally got done running around, I crashed on the couch while Chris got buys building. I think hanging out with Atticus reminded him how awesome building with legos is. I think we’re going to need to get a lego storage box of our own. Oh, and that fashion show I mentioned? Yeah, as much as maybe that’s the reason I’m sick, it was still pretty fun. Michelle and Jexi have started their own line, called Fumé Noir. (They’re still working on their site so there isn’t really anything up there.) 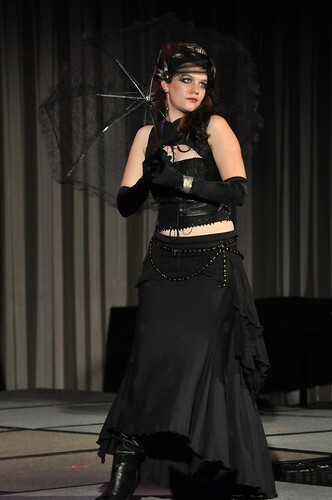 To launch the whole thing off, we did a fashion show at Dorian’s Parlor, the monthly Steam Punk event at the Doubletree hotel in downtown Philly. I absolutely loved the event. It was full of the most amazing nerds ever. My people!! And everyone was so friendly! My friend Tim and his roommate Pat came to hang out with Chris… Tim kept trying to dance, but I have to say, Steam Punk music is a bit tough for guys to move to. I could just do some sort of belly dance weirdness and flail around, didn’t work so well for him. But the guy in the cape (awesome!) and sort of military garb dancing next to us kept giving him encouraging looks. They knew were weren’t mocking them, merely very confused. The costuming was intense. You honestly couldn’t tell the people from the fashion show apart from the folks in attendance. 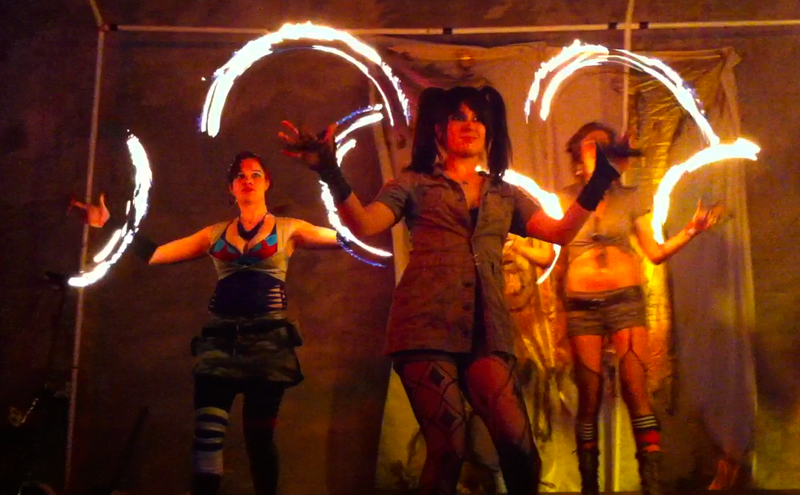 The flickr stream over at the Dorian’s Parlor group has some great shots of our show as well as the general crowd. There were actually two shows, one was all leather stuff… ours was the one with the hoops and bull whip and other fun props :-) Also, after seeing Michelle dance with her sword… yeah, I want one. So here’s my outfit… and so far the only shot I’ve seen with my eyes open. Sheesh, I need to work on that. The whole black-on-black aspect of it didn’t photograph very well, but it looked awesome in person. So Festive!, originally uploaded by ducksRfriends. costume ornaments work as tree decorations too! I really thought I wasn’t going to get a little tree this year. After all, there’s not that much left till Christmas, so there *might* not really be a point in buying it. I have, however, been missing the festive feel even such a small tree brings to the house. Today while running errands, we stopped by Trader Joe’s…. and Chris beelined to the rosemary trees. “Do you want a tree?” What a silly question! Of course! I felt like a little kid, I kept hopping around, super excited about my little tree. Funny how such a small thing can really make the weekend. Now the house smells like clementines and rosemary, the lights are glowing and all is well. Now we have a house full of cookies (from the trade at his family Christmas on Saturday), some fancy festive beer and a hockey game to watch. Great way to head into Sunday night. Christmas Cookies, originally uploaded by ducksRfriends. Its not that I haven’t been wanting to write, its just that I have been running around ridiculously, and not managing to take photos of any of it (and I really don’t like posting without photos, its just too boring). It seems that the holidays tend to do this. To date, I have all but two of my immediate family members presents. Wrapped and everything. The package to Seattle has even been sent already. I’m missing Mike, who still hasn’t gotten back to me, and Chris- who doesn’t really want anything, and I know too well to buy random stuff that I already know he doesn’t need/want. Makes it tough. Next week is Chris’s family Christmas event. We’re doing a cookie exchange, so I made my traditional family cookies. We don’t have a name for them. The recipe just says “festive cookie dough”, but they’re made with creamcheese and chocolate chips, and dipped in chocolate and sprinkles. I think we managed to cook them the perfect amount, too, which is always tough because they look uncooked when you take them out of the oven, but when they cool are soft and just right. Even though I don’t think I’m going to get a little tree this year, making the cookies makes me feel like the holidays are really here. awwww, he brought me flowers! Two awesome date nights in one week! Sunday was Shelly’s Indian dance performance. Dinner and a show, such a lovely night. I’ve been helping her with the costumes the past few weeks, (I didn’t help with anything too complicated, some dying and some seam ripping) it was really nice to see them all together. I really hope that she is nominated for a PEW fellowship this year, she’s very talented and I think she’d be perfect for it. The costumes really were beautiful. I’m amazed with what she did for the black dress- the fabric looked so strange sitting on her work table, but was just great on stage. Tonight he picked me up from work, with a rosemary tree, some wine and some tulips. Oh, and a pumpkin cookie. :-) Dinner at my favorite sushi place ever….. awwwwwww…….. now the house smells like rosemary, and I feel festive. I know its a little early for Christmas, but its ok if its an herb tree, right? This weekend I have quite a list of tasks, we’ll see what actually gets finished. The most complicated task will be replacing the zipper on my mid-weather coat. It was a cheap jacket, and now if I try to zip it up I get stuck in it. I hate sewing zippers, but its really a perfect coat for right-before-it-gets-cold, so its worth the headache. I also have some work on KK’s doc, some sewing, some beading, some audio editing for work, some christmas-present-making and organizing…. sheesh! But at least I have the lovely little tree to smile at when I feel overwhelmed. This year was a small turnout for decorating, but led to some very interesting cookies. Best viewed from my flickr album here. Jen O. brought her lovely puppy DeeDee, and she Mom and I started the decorating. Chris R. came over later, and man is he good at decorating those cookies. Always impresses. Even did a re-creation of last year’s Christmas tree, Tony. What a lovely Christmas it was this year! Minimal as far as gift giving, which was great. Everything that exchanged hands was appreciated and meaningful. True spirit of giving this year. It seems everyone is trying to clean house, and I was lucky enough to get some of the spoils… enough yarn to attempt my first sweater! I’m going to try to make the uber-buttony sweater Miss T made, I just need to get the right kind of needles…. I made up some little bird ornaments for a few friends… a rather quick knit, and I like how they came out…. playing with different yarn combos was fun. They’re from The Purl Bee‘s site…. same place as the lovely handwarmers that I’ve been making… I love their step-by-step photos. Really makes it easier to learn new techniques.